A quality red dot optic is worth its weight in gold. The top red dot optics are simplistic, easy to use and more efficient than simple iron sights. Red dots are great for beginners, and are usually good anywhere from close quarters to up to 100 yards out. Red dot sights are also available across budget ranges, meaning you can find them even if you are a beginner and have a tight budget. 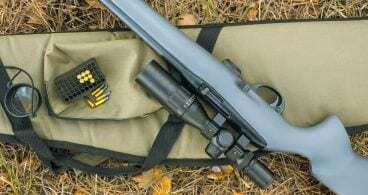 The Bushnell TRS is a great pick for people without a lot of cash to burn. Or if you have some extra cash to burn, you can pick up the Aimpoint Pro, which is one of our favorite picks across any tactical platform. Bottom line – if you are shopping for red dot optics, there’s 5 that really stand out from the rest. Red dot optics are perfect for rifles, shotguns and sub-machine guns. And they’ve proven their worth in over a decade of combat. As mentioned, you can find a red dot sight across the budget spectrum. We’ve included our 5 favorites in our huge AR-15 optics guide, but here in this article, we dive into each of them a little bit deeper to highlight the pluses and minuses of both. Before we jump in, it’s important to know that buying a decent optic doesn’t have to be a budget buster. While some of the optics below are more expensive, there’s a couple that are well within budget even for the most frugal rifle owner. We love all of the sights listed below, and any one of them will do the trick if you are in the market for a new red dot. Let’s jump in and look at our favorites in more detail, and highlight which might be a good fit for your rifle. 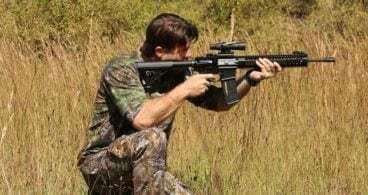 The Ozark Armament Rhino Tactical red dot sight is proof you can buy a quality red dot optic without spending a fortune. But bear in mind that the Ozark Armament Rhino isn’t one of those go-to-battle red dot optics. They designed the Rhino red dot for recreational shooting and sport. The Rhino is the perfect optic for the plinker and hobby shooter. And if you are a new three-gun shooter on a budget, you’ll appreciate the Rhino Red dot. The Rhino Red dot is a simple red dot scope with a 35mm objective lens. The objective lens makes it a full-sized red dot optic with a precise 4 MOA red dot. The optic is lightweight, so there is no noticeable weight increase on the rifle. The Rhino comes with a single piece scope mount that is a cantilever design. Also, it attaches around the center of the scope and takes up little space on a flat top upper receiver. The mount uses a simple screw on system to secure the scope to the upper. The screw goes through the Picatinny rails so the scope doesn’t slide back and forth on the rails when the weapon recoils. But even a heavy recoiling weapon like a 12-gauge shotgun doesn’t make the Rhino budge. Ozark Armament was wise to use a total of six screws where the mount meets the optic. This ensures it stays secure when faced with the fiercest recoil. And this is essential if you hope to retain any semblance of a zero. Also, Ozark includes two flip up lens covers. So they simply slip into place and click closed. And once you flip them upwards, they stay in place because they are hinged to the optic itself. They won’t be getting lost in your range bag anytime soon. The Rhino has 10 different settings for two different color reticles. Better yet, the reticles are green and red to offer versatility to the user. Both colors have their purpose, allowing you to use the optic in a variety of different situations. The green dot is better suited for low light situations, as well as for indoor use. The green dot is much easier on the eyes, so it doesn’t cause as much strain when you use it for long periods of time. Also, a green dot is noticeably hard to see when shooting in a rural environment, so hunting would be difficult. This is because the green dot will match the background of a natural environment during the day. However, the green dot is handy in situations where the red dot is useless. The red dot is much brighter and easier to see in brighter situations. This is especially true when shooting outdoors on a sunny afternoon. The red dot is incredibly visible but can strain your eye when you use it in low light situations. The Rhino also can co-witness with standard AR sights. Co-witnessing is being able to use your iron sights without having to move the optic out of the way. Ozark Armament put a lot of thought into this simple yet affordable red dot scope. The Ozark Armament Rhino may not be a go-to-war optic. But for the price, it’s hard to beat if you aren’t going into Mogadishu. It’s the perfect companion for the Smith and Wesson M&P 22, a Keltec PLR 16-22 or the classic Ruger 10-22. The Ozark Armament Rhino is one of the top red dot optics at a great price point. Vortex joined the gun industry with one mission: To create high-quality red dot optics at an affordable price. They have a massive line of optics that range in cost from several thousand dollars to under 200 dollars. The Sparc 2 was one of the two optics that made Vortex jump out at gun owners. The Sparc 2 is a red dot optic that is both budget-friendly and high quality. What’s fascinating about the Sparc 2 is that it is affordable enough for everyone to own. Also, it is reliable enough for you to trust it for home defense. SPARC stands for Speed Point Aiming for Rapid Combat. They designed this optic for defensive use. 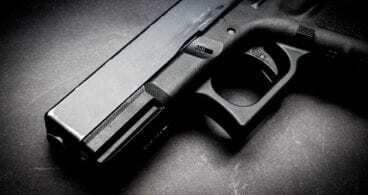 It’s an affordable option for home defense and also for tactical shooting competitions. While they didn’t build it using military specifications, the Sparc 2 would be an excellent choice for a police officer or the everyday shooter. The Sparc 2 has unlimited eye relief and you can use it with a wide variety of weapons. It’s strong enough for a tactical 12-gauge shotgun and precise enough for the AR 15. The Sparc 2 is only 3.1 inches long and weighs only 5.9 ounces. Vortex also produces a line of magnifiers that are compatible with the Sparc 2. These magnifiers are far from expensive and great for a rifle. The extra magnification turns the Sparc 2 into an incredibly versatile optic. They multi-coated the lenses, so looking through them gives the shooter a bright sight picture. The multi-coating also reduces glare when shooting on bright, sunny days. The Sparc 2 is well-refined for the money you spend on the top red dot optics. The Sparc 2 has a 2 MOA red dot, making it a great choice for a rifle. A small red dot is less likely to obscure your target at distant ranges. You can see your enemy at 200 yards, too. The Sparc 2 uses a single piece chassis to increase the overall strength of the unit. The single unit also makes it resistant to water and debris. On top of the single piece design, they sealed the Sparc 2 from water with an O-ring. They include a high mount, a low mount and a spacer for easy use with different types of weapons. This includes being able to co-witness with standard height AR 15 sights. You utilize a single CR 2032 in the Sparc, so it lasts for 5,000 hours at minimum brightness. Also, it has a total life of 500 hours at the highest power. The Sparc 2 also has an auto shut off to conserve the battery after 12 hours, so you don’t accidentally leave it on in the safe. The Sparc 2 has 10 settings for brightness. At the max setting, it can be uncomfortable in low to average light. On sunny days, the dark eye pro goes at the brightest setting. The lowest two settings are compatible with night vision. These two settings for nighttime increases the optic’s versatility. You can toss the Sparc 2 and a night vision optic on your gun and be ready to go. Another feature includes the digital rear-facing controls. This means when you turn it on, the Sparc returns to your last brightness setting. This makes it one of the top red dot optics that’s ready to roll when you push the button. The Sparc 2 is an affordable, high-tech optic for home defense. The second Vortex optic on this list is another excellent option for use on defensive firearms. They priced this red dot affordably, and the Strikefire 2 is a dependable optic. This is one of the most affordable top red dot optics suitable for defensive duty. The Strikefire 2 is a full-sized optic when you compare it to the Vortex Sparc 2. The Strikefire 2 is a bit bigger, making it easier to use. 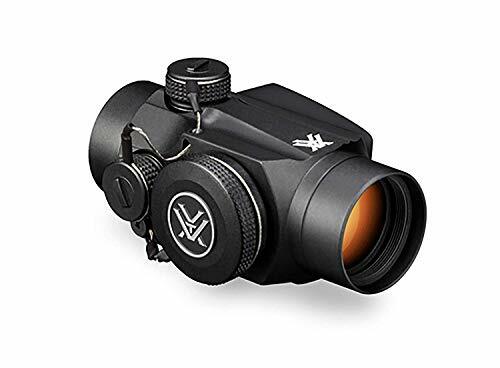 The larger size makes it compatible with accessories like aftermarket magnifiers and night vision clip-on devices. The Strikefire 2’s size is a serious advantage in a lot of ways. Although it weighs a bit more and is a bit longer, there are advantages. The Strikefire 2’s bigger objective lens and bigger eyebox make it easier to get behind the optic. The optic only weighs 7.2 ounces and is 5.6 inches long. It is larger and heavier than the Sparc 2, but the tradeoff is worth it in some applications. The Strikefire has a 4 MOA reticle that is a compromise in size. A bigger red dot is easier to see and easier to catch with the eyes. This makes it efficient at close quarters combat and faster to transition from target to target. The moderately-sized dot is for precision and doesn’t obscure your target at longer ranges. The further targets are away, the smaller they appear. This could mean the difference between hitting your target and not even seeing your target. At 4 MOA, you get a decently sized dot that’s easy to see, yet small enough to maintain your range. Also, you can change the 4 MOA dot from green to red on demand. This lends well to the optics versatility. Green reticles are easy to see indoors and in low light conditions. And red is better for outdoors or high light situations. The optic includes a high-quality cantilever mount to provide a stable, adaptable base. The optic will co-witness with the lower 1/3rd cantilever mount. This gives you a first one-third co-witness with AR sights. The body of the optic is aircraft grade aluminum, which is both shockproof and waterproof. This is one of the most durable top red dot optics on today’s market. Like all Vortex red dot optics, the Strikefire 2 comes with a ton of extra features. There is an auto shut off feature that’ll turn the optic off after 12 hours. This auto off feature extends the life of the already long-lasting battery. At the max setting, a lithium battery will allow the optic to run for 300 continuous hours. At the minimum setting, the Strikefire 2 will last 6,000 hours. The on and off controls are quite sleek and on the rear of the Strikefire 2. The two buttons will turn the optic on and adjust the brightness level. The optic will also boot up to the last brightness setting. Also, you get 10 total brightness levels with the lowest two being night vision compatible. The lenses are fully multicoated for a clear, glare-free sight picture. The unlimited eye relief makes the optic easy to get into action. Since there is no eye relief once the gun is in your shoulder you can start using the red dot. 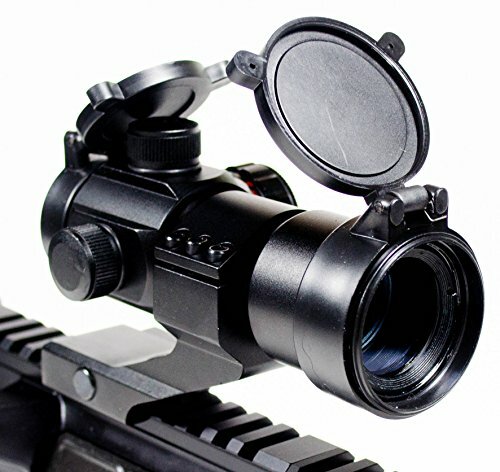 You can combine the Strikefire 2 with any number of accessories like magnifiers and night vision devices. Along with the dual reticle system, the optic is versatile, simple and capable. The Bushnell TRS 25 was the sleeper hit of 2014. It snuck into the top red dot optics market and immediately became a favorite among budget-minded shooters. 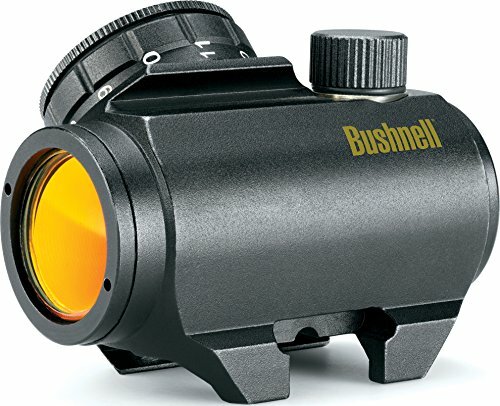 Bushnell is traditionally a company that produces optics for the hunting industry. But their expansion into the AR line of rifles has been favorable. The Bushnell TRS 25 is a compact red dot optic they designed for modern sporting rifles. While the TRS 25 is part of the AR line of optics, it is well suited on an AK 47, a Scorpion carbine or any other semi-automatic modern rifle. The TRS 25 sits in an odd spot in the world of red dot optics. It’s not a miniature red dot like a Trijicon RMR or a full-sized red dot like the Aimpoint M4. It sits in the middle as a compact yet capable optic. Compact optics are small and light and perfect for users who want to keep a low profile with their weapon. The lower the profile, the lighter the weapon is, so it is less likely to get caught on something while on the move. Small weapons like carbines, sub-machine guns and shotguns are useful for compact optics. The TRS 25 is suitable for a low-profile weapon. The optic is only 2.4 inches long and weighs 3.7 ounces. They reduced the height by using an integral mount to make the optic fit low on a weapon. You can fit the TRS 25 with spacers to make a little higher when necessary. Also, you can use spacers to lift the sight for shooter comfort or to co-witness with different height sights. The TRS 25 can co-witness easily with standard AR 15 sights. The well-built TRS 25 is waterproof, fog proof and shockproof. This is surprising for an optic under a hundred dollars. It’s durable single piece aluminum construction aids in its ability to be so tough. The 3 MOA dot is the average size you’ll see with the top red dot optics. This is a small optic, but the dot is still crisp and clear. The only washout you see is when you jack the brightness levels to the top. The lenses are amber-tinted, and if you’ve ever worn Amber sunglasses, you know what this does. Also, the amber lenses brighten up your view and give a clear sight picture. The amber coating doesn’t impact vision or make it difficult to use the optic. The red dot has eleven different brightness settings that give a wide swath of options for shooters. The dot is only red and the control for the intensity levels is on a knob on the top of the optic. This knob also turns the TRS 25 on and off. The TRS 25 would be best as a home defense optic. Its small size makes it convenient and puts it out of the way when storing your rifle. The TRS 25 is reliable and durable. Its capable of taking some serious abuse but it just keeps on chugging. Aimpoint and red dot are basically synonymous terms at this point. They created the first red dot optics in 1975 and has been producing them ever since. The Aimpoint name stands for high quality, well made, functional red dot optics. The Aimpoint M4 is the current red dot issued in the United States Army and an excellent optic. It’s also an expensive optic, although not quite as expensive as Trijicon ACOG scopes. To answer the demand for a more affordable optic for police and civilians, Aimpoint introduced the Aimpoint Pro. 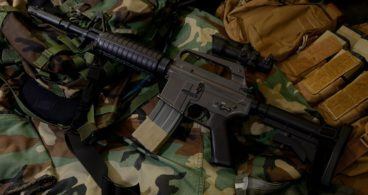 While the Aimpoint Pro is more affordable, it is not a hobby or beginner optic It is a dedicated combat optic that can go to war and come back kicking. Well-made is the word to use when describing the Aimpoint Pro Patrol red dot. It’s a bombproof optic they designed to ride in squad cars being banged around. It takes some real abuse, and let’s not even start on how much recoil this thing can take. It can take more recoil than your shoulder, that’s for sure. You can submerge the Aimpoint Pro Patrol in up to 150 feet in water. The optic can perform at extremely low and high temperatures and will maintain zero in alternative temperatures. The Aimpoint Pro isn’t just night vision compatible, it’s compatible with all generations of night vision. The unique band pass coating on the lenses makes this possible. The optic has separate night vision settings that are nearly invisible to the naked eye. They designed the Aimpoint Pro for taking accurate shots with a rifle at ranges up to 200 yards. The red dot reticle is 2 MOA and incredibly clean and precise. The red dot has zero washout, even at the highest settings. 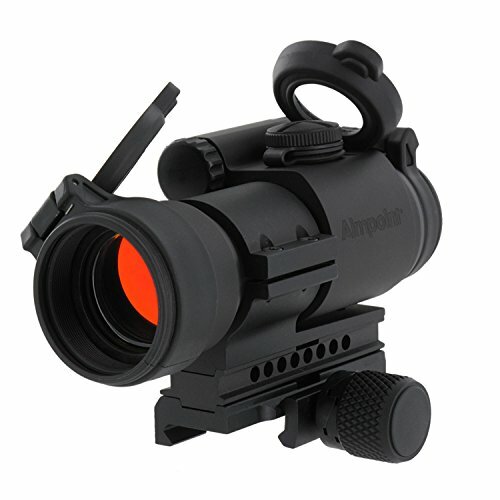 The Aimpoint Pro Patrol comes with the QRP2 mount that co-witnesses with iron sights. They outfitted the optic with lens caps to protect the lenses when the optic isn’t in use. You can even attach an anti-reflection device that threads onto the front lens. What’s impressive is the fact the battery will last for three years of continuous use. You can just leave the optic on and toss it in the patrol car or home safe. To use it, all you have to do is grab your rifle and it’s ready to go. The Aimpoint Pro is one of the go-to top red dot optics for a wide variety of purposes with tactical use being the most apparent. 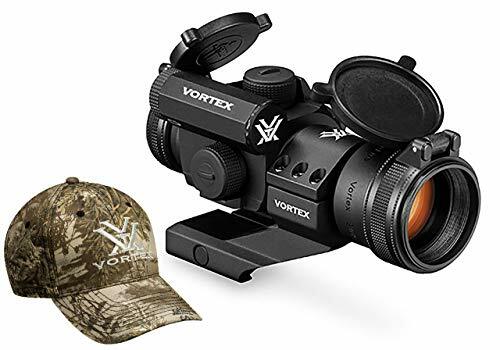 It’s also great for hunting when you pair it with a magnifier or night vision device. You can use the Aimpoint on a wide variety of weapons, including carbines, shotguns and even full powered battle rifles. The Aimpoint Pro Patrol is by far the best optic on this list. Red dot optics have become extremely popular in the last decade or so. With the Global War on Terror changing the face of warfare, the red dot has become the standard optic for the military. And the civilian and police world have slowly adopted the red dot and it’s proven to have staying power. These five products are the top red dot optics on the market today. They are often cheaper than holographic sights, and can make a great addition to any gun enthusiast’s firearms collection.